Step out of your comfort zone, try the restaurants in Tanjung Benoa & Nusa Dua! 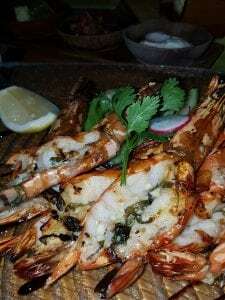 Staying in Tanjung Benoa Nusa Dua on the south coast of Bali, we decided to see what dining opportunities were at restaurants nearby. We stepped out of our hotel and began walking. It’s always a warm night in Bali but when the gentle sea breezes start wafting in over the ocean it adds a balmy tropical atmosphere to the air. An evening walk in Bali has become one of the many things we enjoy as we find ourselves somewhere new to dine each night. We’re happy to explore different cuisines and flavours but generally look for unique and original restaurants to try so our experience is complete. We visited this new restaurant with friends to sample their much talked about 8 course tasting menu. Small portions, perfectly balanced providing a great sample of local produce with a contemporary Indonesian flavours. Always good to return to this restaurant for their outstanding friendly service, and great menu options. This time our choices were Whole Snapper – bali style and Lobster mornay. Owned by an Aussie, this restaurant has always met travelers needs and we love the simplistic food choices on their menu. A nice surprise! 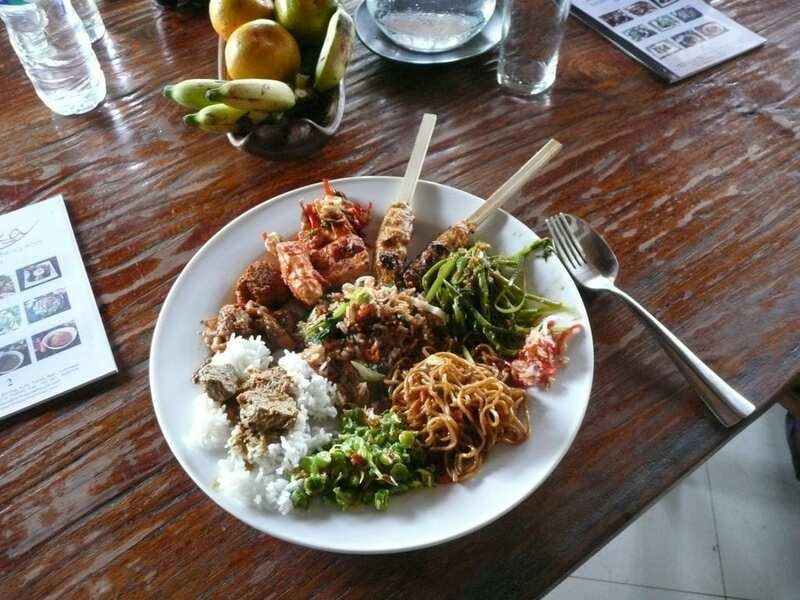 Suggested by our driver Irun, this restaurant was a mix of traditional Balinese and Western style menu. Kampung Bule serves Balinese Herbs & Spice BBQ, great Seafood selections and for those who want western style – some old favourites as well. We were impressed by the seafood choices and started with a shared serving of Prawn Spring Rolls followed with Lobster Thermidor for our mains … just because! The seafood was delicious although the lobster was a little expensive, however for a special night it was well worth the expense! We ordered a Moscow Mule: Mix Vodka with Lime Juice, muddle some fresh Mint Leaves and add a splash of Ginger Ale and dress with a slice of lime. You must try it! Our second visit to Glaze restaurant, a sister restaurant to the Chef’s Room (next door). We previously visited about 2 years ago and enjoyed a great meal so decided to re-visit. Trevor couldn’t resist the Pork Ribs .. a huge serving of mildly spiced ribs, which he devoured like a caveman! I chose the Baby Crayfish which were delicate flavours and served with a choice of 3 sambals. We both finished our night with Ron’s favourite Desert plate which was absolutely delicious. Gorgeous Balinese style decor, attentive staff and amazing food … we’ll be back again! In Bali Connections we opted for Japanese for lunch so stepped into this quiet little restaurant. At night, the Kizuna Teppanaki chefs ply their skills but at lunchtime it’s more of a simple menu. To sample the tastes we love to share our foods so ordered Vegetable Spring Rolls, pork goyza dumplings with various sambals and Okonomi yaki (a delicious seafood omlette pizza). We’re going to sample the evening Teppanyaki experience next time we visit Bali! BBQ Ribs are one of their signature dishes that we’d been told we must try, so we dropped in on our last night in Tanjung Benowa. Our table declared them the best ribs in Benowa; succulent and juicy (fall off the bone) with a unique blend of Balinese spices. Mark this down as a good ribs and beer restaurant! 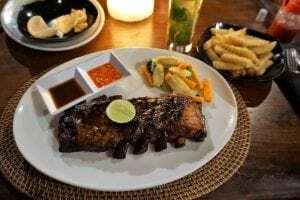 There are many other great restaurants in Tanjung Benoa and Nusa Dua but here’s 6 of our favourites to get you started! Check out our post … Why we bought a Timeshare! Be sure to stop in and try out some very unique dining experiences. If there are other restaurants you think I should know about please drop us a note in the comments below!